The Asparagus Season (April 23rd – June 21st in the UK) heralds spring, a whole range of new vegetables and an end to winter. Ideally, asparagus is best served very fresh – mine came from Perry Court Farm and Martin (the farmer) said they were out picking on Saturday night in order to sell it at the Farmers’ Market on Sunday morning. If you buy it from a supermarket it will be at least several weeks old and will have lost a lot of flavour. Asparagus can be steamed, fried, griddled, poached, added to casseroles, frittata (Hot, Cheap & Easy’s recipe), quiche, soups, stews, etc. I’m quite partial to steaming and recently found that it poaches very well on a barbecue. It’s delicious as a starter with butter, garlic and lemon juice, though my favourite is with Hollandaise Sauce. 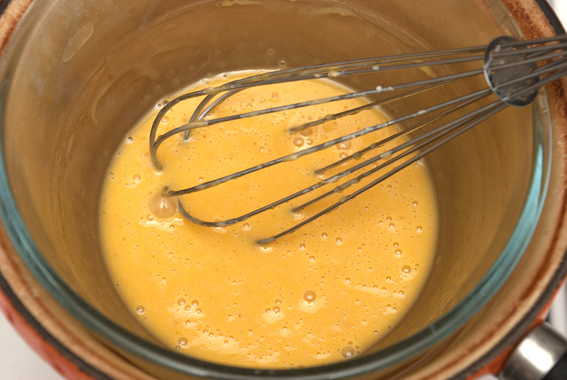 Hollandaise originally came from the Netherlands (hence the name) and is generally made by mixing egg yolks and butter, with vinegar or lemon juice. 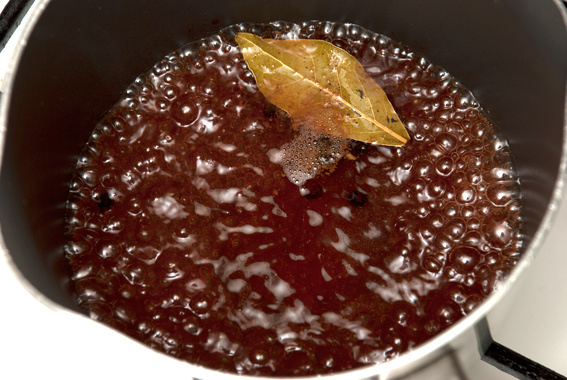 Put the red wine vinegar (white wine vinegar is also good and the sauce will look lighter as a result) into a saucepan with the peppercorns, bay leaf and mace. This needs to be reduced until there’s only about a dessertspoonful left. Open the window, this will make your eyes run and you may cough. I once made Hollandaise for 10 people at Christmas, reducing 2 bottles of red wine vinegar and it was most unpleasant (fortunately a bottle of Stoli got me through the ordeal in one piece)! Once reduced, allow to cool. 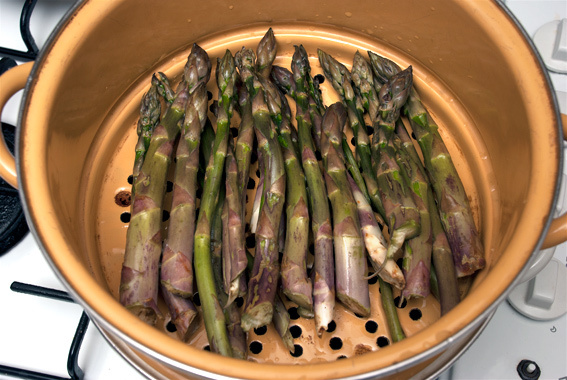 Steam or boil the asparagus for about 4 -5 minutes in salted water. Test it with a fork to see when it’s tender and be sure not to let it go soggy. While the asparagus is steaming, mix the two egg yolks with about a quarter of the butter (a big teaspoonful) and a sprinkle of salt, in a glass bowl. Put the bowl into a saucepan of lukewarm water (a bain-marie) and whisk in the strained vinegar, while heating gently. Do not allow the saucepan of water to get too hot or boil, as the Hollandaise will separate. Whisk in all the remaining butter and check the taste. 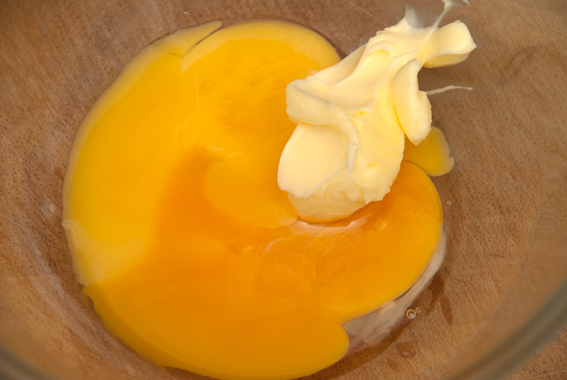 Hollandaise Sauce should be buttery with a slight tang from the vinegar. If it’s too sharp add more butter and do likewise if it starts to get too thick. When done, pour onto the asparagus and serve immediately. Asparagus and Hollandaise goes very well with a crisp white wine, such as Mâcon-Villages or Sancerre. Hollandaise Sauce will also go very well with fish and other vegetable dishes. This entry was posted in Drink, Food, Recipes, Shopping and tagged asparagus, bain-marie, bay leaf, butter, crisp white wine, eggs, Hollandaise Sauce, mace, Perry Court Farm, red wine vinegar. Bookmark the permalink. If you just parboil the asparagus and then flash-fry it afterward it might be interesting … Not a criticism though… my wife loves boiled asparagus and I really only like it stir-fried so if I try your recipe (and I love the sauce) I might do a compromise. Looks delicious! I will have to give this a try…always been a bit intimidated, but perhaps the Stoli Solution will work for the nerves as well as the vinegar? oh Asparagus, how I love thee!!! I love the hollandaise here, YUM!! Now that takes holland arise to a whole new level! It’s probably my favourite thing from Holland. Well.. now I learned something new today! This is a different Hollandaise than I’m used to, MD, but one I have to try. Thanks for the recipe and accompanying warning. Those fumes and my parrot won’t mix. Not to worry. A couple open windows and all will be well. “A rage of vegetables….. ” … interesting that such a carnivore as you ,Mad Dog, likes to think of his vegetables as having personalities and emotions…. Hollandaise to die for btw. I seem to remember that, that was your plate of asparagus! 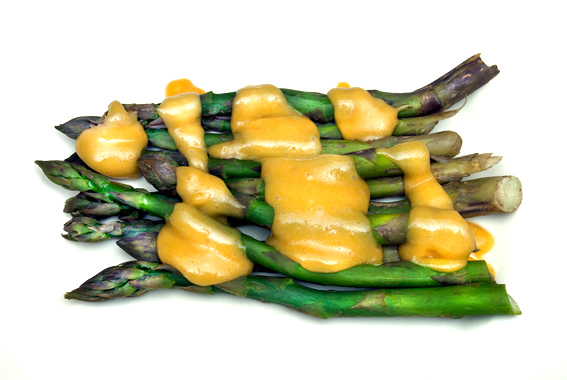 That looks wonderful and I admire you for making the Hollandaise sauce, something I haven’t done for many years, but I think I may continue with the big, big cheat of eating asparagus with olive oil and chopped garlic! get some of the bio-dynamic or organic eggs from the Farmers’ Market, soft boil them and dip your asparagus into the yolk that has been sprinkled with just a little white pepper…. omg! you will love it, better than any sauce you can make, i promise you! That’s definitely a good one! I love asparagus season, when I lived in Germany there was huge festivals to market it’s arrival, which was the white asparagus. I’ve seen that but never tried it – I believe they force it like rhubarb. Did you know that Boli and Stoli are the favourites of James Bond as well as Edina and Patsy!